What would an internationally recognized cruise expert say if you asked her what to pack for a cruise? If you are like me, you might expect such an expert’s advice to be long and complicated, filled with clever little devices and secret clothing items. Well, when I interviewed Daily Telegraph travel columnist, Jane Archer, her advice for what to pack for a cruise was surprisingly simple. In fact, that’s the point! I hope that you enjoy my interview with Jane Archer. Please add your questions for Jane in the discussion section below. First, let’s look at Jane’s general tips for packing for a cruise. Then, we’ll discuss 4 questions that you should ask yourself before packing your suitcase. Jane points out that, unless you are taking a cruise to the Antarctic, or a similarly adventurous location, you don’t need any special equipment. In fact, Jane uses the same simple suitcase for all of her trips. This is intentional. Since she uses the same bag, she instantly knows if something has gone missing – before she sets foot on the cruise ship. She also reminds us that, while it is fun to dress up for dinner, you probably don’t need a different outfit for every night of the week. So, pack your favorite cocktail dresses, but, don’t go crazy! It’s much better to be comfortable and light than fashionable and overwhelmed. One potential exception to this rule comes if you are traveling on one of the luxury cruise lines. Companies like Cunard may have dress requirements for dinner. So, it makes sense to check with them first. Beyond the basics, Jane says that there are 4 questions that we can ask to help determine what we should take with us on our cruise. Are You the Queen or a Celebrity? Unless you are a member of the royal family or a celebrity, no-one really cares what you look like. As a result, the number one rule when it comes to cruising is – dress for comfort. In most cases, if you pack a top for each day, two pairs of pants or a skirts and one “little black dress,” you’re set. In terms of accessories, make sure that you find out what entertainment options are available on your ship before you pack your bags. Some ships have tennis courts, pools, climbing walls and more. So, pack for your passions! Other than that, stay comfy. Trust me – your Facebook friends will be too busy being jealous to notice that you wore the same summer dress two days in a row! How Long is the Cruise? What Will the Weather Be Like? Ok, that’s two questions, but, in fairness, they’re related. Jane points out that the longer your cruise, the more you need to plan for different eventualities. 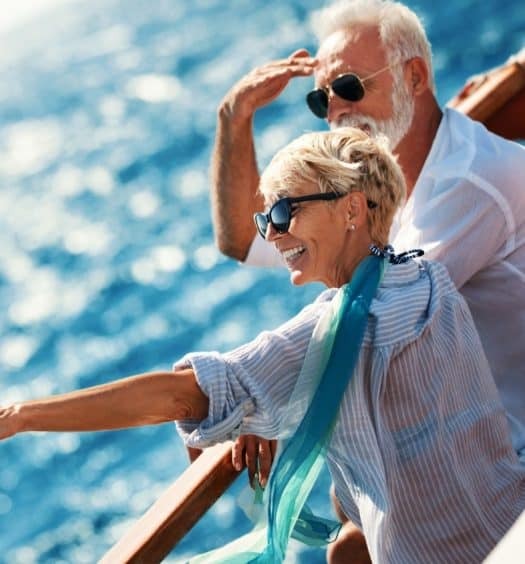 It may be warm and cozy on the ship, but, if you are planning a Baltic cruise, packing winter clothes, including hat and gloves, will give you the flexibility to explore during your shore time. If you forget something, don’t worry! There will be plenty of opportunities to pick up replacement accessories along the way. In fact, finding funky clothes in exotic markets can be a great deal of fun in and of itself! How Technology Dependent Am I? Are you an Internet addict, like me? If so, you may want to take your laptop along. Or, on the other hand, perhaps this is a perfect opportunity to leave it at home! The choice is yours. Just remember that the Internet rooms on most cruise ships are expensive. So, if you do decide to “disconnect” for a few days, make sure that you are committed. If you do decide to take your electronic devices with you, make sure that you take an international adapter. I learned the hard way that buying an adapter in another country, while possible, is unnecessarily expensive! While we’re on the topic of electronics, Jane suggests taking an external hard drive to back up your data. What Special Needs Do I Have? Finally, make a list of all of the medical necessities and little luxuries that you can’t live without. Make sure that you get a doctor’s note for any medications that you need to take with you. Doctors have notoriously bad handwriting, so, a note usually works better. If you have a bad ankle, take an ankle brace. If you think you may get seasick, take some pills. You know your body better than anyone else. While finding clothes in exotic locations is fun, finding medicine is not. So, take the time to think through all of your needs. In my case, I love adult coloring books and I don’t leave the house without 2 or 3. Jane is rarely seen without her pad and paper, which makes sense, given her profession. What are your passions? Do you love knitting? Are you a fan or audiobooks? Do you, like me, love coloring books? This is your cruise. Make it perfect! What items do you always take with you when you travel? Are there any “small luxuries” that you can’t leave home without? What did you think about my guest’s advice on what to pack for a cruise? Please join the conversation.